Like all conferences of the elite, the annual meetings of the American Academy of Religion and the Society of Biblical Literature are theater. There’s a level of make-believe that goes into transitioning from our quotidian concerns to those befitting the sacred gathering. The #sblaar14 Twitter feed bears witness to participants changing in and out of character, from a journeyers delayed at the airport to an expert panelist. Often we are pretty good at playing the part of the sage or the eager disciple. It’s hard for me to imagine that seemingly self-important traditions like conference gatherings would continue otherwise. But there are holes in our objectifying methods, moments where it becomes all too clear that we, too, are a discursive spectacle worthy of scrutiny. 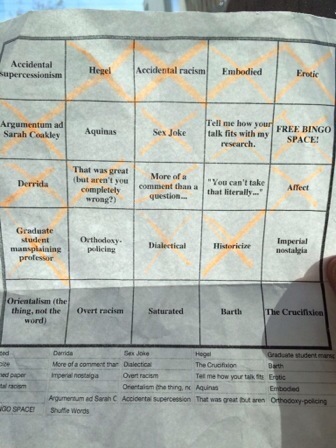 Perhaps, this is why #SBLAAR14 bingo was a such a hit. The game sheet is akin to the notes from a theatrical workshop, remarking on those quirky affects that ruin the performative illusion. If you’re asking about my motivation, I assure you that it is not to call out any one particular form of discrimination. Rather, I aim to impress that such awkward moments reflect the reality that the so-called apolitical, discriminating objectivity claimed by the guild’s method actors needs work. I don’t know the story behind the aforementioned tweets and prefer to think that their original contexts would assuage my concerns. But as is, the performances they represent leave something to be desired; do they not? Let us not act as if the scholar’s claim of enlightenment is so different than those of the communities we choose to study. Critical inquiry would remind us that “all of the world’s a stage, and all the men and women merely players.” Were we to remember and explore this, then we’d truly be playing our part.